In this exhibition, Stills, Northwest artist Sherrie Wolf further varies her practice of juxtaposing still life paintings with a variety of references from art history. 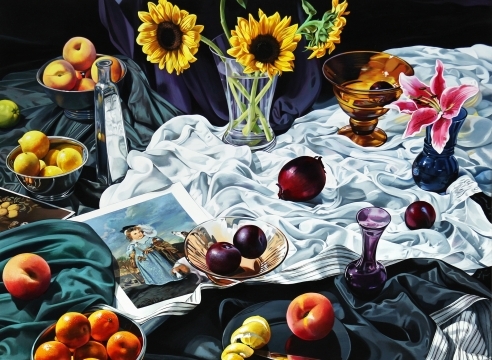 Well known for her exacting realism, Wolf continues in the still life tradition with a diverse array of fruits, flowers, bowls, and vases as a central focus of her paintings. She adds new energy and visual complexity with the layering of vibrantly patterned and textured fabrics and objects d’art across the canvas. Art historical references remain, but they are integrated into the image as postcards or book illustrations. Wolf explains that her latest direction was inspired by 30 years worth of collecting materials for her paintings, and when scanning her studio she saw new potential for more complex, abstract compositions. She notes that “cropped abstract shapes take on more importance than the actual objects, creating a field of uniform visual intensity, and new content is often revealed after intuitive choices are made.” The results are beautiful and rewarding. Sherrie Wolf graduated from the Museum Art School, now the Pacific Northwest College of Art, Portland, OR, in 1974 and received an MA from the Chelsea College of Art in London, England in 1975. She began exhibiting her work in the mid 1970s while teaching art at PNCA. Her work is included in such collections as The Vivian and Gordon Gilkey Center for Graphic Arts, Portland Art Museum; Hallie Ford Museum, Salem, OR; the Tacoma Art Museum, Washington; City of Seattle; and Washington State Art Collection. In 2010, her work was included in The Secret Language of Animals, at the Tacoma Art Museum, WA, and in Album: Artist Portraits of Artists, the 30th anniversary exhibition of The Art Gym at Marylhurst University, OR. In 2012,Wolf’s work was presented in a solo exhibition at Northern Arizona University in Flagstaff, and 2014 will bring a solo show at the Long Beach Museum of Art in Southern California.